Sue Collins, R.N. 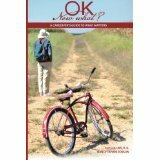 and Nancy Taylor Robson’s new nonfiction book, OK Now What? A Caregiver’s Guide To What Matters is dedicated to friends, family, loved ones and caregivers past, present and future. This book asks – What matters most when someone close to you has been diagnosed as terminal? The authors explore ways people can address the all-important time and quality of life issues for the caregiver and the loved ones while coping with the practical and emotional questions of this challenging passage. Jan: Sue, what led you to become a hospice nurse and to continue in that role for 29 years? Jan: Nancy, as the author of three other books on a variety of topics, what led you to become a co-author on this book with Sue Collins? Nancy: I’m also a gardener, which gives you annual proof of the cycle of life, the fact that life here is finite. That is one of the things that makes it all so precious. But it’s also what can be so discouraging and begs the question: If it’s all going to be gone sometime, what’s the point? I get discouraged like everyone else, but also firmly believe that there is something beyond this life. Hospice nurses usually do as well. Sue and I immediately discovered we were on the same page spiritually, so the idea of writing about how to walk that last piece here – difficult though it may be at times — as well and as gracefully as possible clicked between us. We each came to the project with different but complementary skill sets, which also helped. Jan: And tell readers about the title and the significance of the red bicycle. Nancy: A bike implies transition and forward motion, but it doesn’t move on its own. We need to get on and pedal; it’s up to us to use our energies, our intent to keep it (and ourselves) going. The effort builds muscles, both physical and emotional, and takes us out into the world. Sue: About half way through writing the book, I became restless about a book cover and title. One night I had a dream about a bike. Excited I called Nancy. I love cool colors so I saw a teal ( my favorite color) bike. Nancy, who enjoys the warm colors, said No it’s red! Immediately I knew she was right, red felt right. I called a hospice friend and colleague, a word smith, and we had fun and got a little silly ( because it helps cope) putting the title together. Jan: What parts of the book have readers found to be most useful? Nancy: I’ve had several people say to me that the explanation of what is ‘normal’ physically as the body is slowly shutting down is very helpful, but that they most appreciated was hearing others’ stories that are interspersed in the book. One reader said it was like having a non-judgmental friend hold her hand through the whole process. Sue: The stories. I believe it is easier to read stories then it is to read about death and dying in clinical terms. Stories are real and people can relate. Jan: OK Now What? presents a straightforward account of the difficult personal reality for caregivers and families of terminally ill people. How do you, Sue, as a hospice nurse and you, Nancy as someone who has been a caregiver for a loved one, see attitudes in the medical community changing in both the public and private response to death and dying? Nancy: I’m not very much in touch with the medical community, though I do go to doctors, two of whom are friends. In my experience they like many others wrestle with how to approach this topic effectively yet kindly and practically. Sue: Some doctors don’t want their patients to feel they have abandoned them with the reality of a disease progression. And the American Society generally wants to make sure every possible treatment has been tried no matter how much things have spread. It often can be a struggle for both the doctor and the patient. The trend I am noticing, people seemed more informed, perhaps because of the internet, which results in honest conversations, and that is a good thing. Jan: What do you see as critical mistakes families often make initially in addressing a terminally ill person? And how can they avoid these mistakes? Nancy: Not getting their paperwork in order in time. It’s crucial. And not that difficult. Sue: Not having straight forwarded discussions about what the dying want, what is happening and how to approach care. Some folks still want to avoid ‘talking about it’. I was very fortunate enough to have a colleague teach me early on to use the words, dying and death in my conversations with families. “Don’t sugar coat it! she said” I always encourage families to do the same and they do just fine. Jan: It seems to me that often people use denial or repression and false hope in dealing with the pending loss of a loved one. What do you see as the long-term effects of this approach? Nancy: You miss the opportunity to sit with the person and kind of recap that life with them. When we could see that my mother-in-law was slowly declining, I stop trying to have discussions with her about politics or books and instead asked her questions about what her childhood had been like, things that she had never talked about, at least with me, that gave me something of an insight into who she was. She was more animated when she talked about some of that stuff. Even if you try to do this and don’t get that kind of response, at least you’ve made the effort, so you don’t end up saying: Gosh, I WISH I had asked how he felt about being the youngest kid in high school or what it was like to lose your mom so early, or whatever. Jan: How did writing this book help you both deal with trauma and provide catharsis? Nancy: I actually found parts of this book very difficult to write because they were so specific, both the physical and mental decline that you are often witnessing. The pain of losing someone you love and the struggle to do it with grace and without recrimination for whatever slights or mistakes you feel you suffered at their hands, or conversely whatever parts of that relationship you depend on and will sorely miss is a constant spiritual journey. But at the same time, the stories of those who have managed this and the flashes of grace and glimmers of hope that you get kept me writing. And rewriting! Sue: It certainly is not something you get use to, each situation is different and each loss is different. Again, the stories help put emotions into perspective. Stories of courage and the generosity of families to stand behind the dying person choices is inspiring. I find myself wanting to share the stories in hopes that the reader may finds some comfort. Meeting weekly to discuss a piece of writing made us laugh, cry, feel frustrated, empathic, sorry but always energized to move forward. I enjoyed this writing process and learned a lot. Jan: What do you hope readers learn from reading this book? Nancy: I hope that foremost that it will act as the friend who is always there to hold your hand even when you can’t get anyone on the phone, or maybe don’t want to confide in someone else what you’re going through at that moment. But I also know that the clinical details that Sue has laid out here are a great help and encouragement – -for example, the chapter on drugs, which was very thoroughly vetted by a geriatric specialist, are really helpful in easing someone’s mind about what a huge help drugs, when properly prescribed and administered, can be to quality of life in these situations. Sue: I hope they learn to relax a bit and not walk around acting glum and sad 24/7. I hope they learn to share some laughter and joy, the dying want that too. Jan: I was pleased to see a resource section in this book that addressed dealing with young children on death and dying issues, but I was also quite surprised to see a section devoted to recipes? Tell readers about these sections. Nancy: One of our editors suggested I add them and when I thought it over, it made sense. This was specifically for the harried caregiver, who often neglects him or herself in these situations. I used to write a food column called Sunday Cooking, which is what I did when my children were in school. I cooked several things on Sunday (and included them so they both learned to cook), and we ate well all week. So few people these days either cook, or even know how to cook easy, wholesome meals, yet quality food/nutrition is key to our health, especially when you’re stressed. I wanted to offer some easy, strategies for healthy meals. Sue: This was Nancy’s inspiration. The readers have been pleasantly surprised to see the recipes and are grateful. Jan: What advice about writing have you both found helpful and what advice have you chosen to ignore? Nancy: I’ve been writing professionally for a long time. The big thing I learned early on is: Distill, which means hone your work as you would the edge of a knife – carefully, mindfully and with an eye to its ultimate use. I’ve written for newspapers and magazines for years, and it teaches you to get to the point and to write for your audience. You work really hard to convey whatever you’re writing about clearly, gracefully, and as engagingly as possible in the space allotted. No one’s got time or patience to wade through purely self-indulgent prose. Sue: Nurses are taught to write in disjointed statements with the threat of a lawyer looking over your shoulder. The first piece I sent Nancy I wrote and re-wrote, woke up in the middle of several nights to change a sentence or paragraph, it was bit daunting. But when Nancy said it was ‘not bad’ I slept great that night. Meeting weekly to discuss a piece of writing made us laugh, cry, feel frustrated, empathetic, sorry yet always energized to move forward. I enjoyed this writing process and learned a lot. And I discovered what is meant by the book wrote itself. When we were struggling with a piece a situation always presented itself and guided us….I loved it. Jan: In case I’ve missed something essential: What question(s) do you wish I had asked? Ask it here and add your response. Nancy: Who is this book for? Anyone who is going to be primary caregiver or in some way associate with someone you care about who is walking that last mile. It will help you understand better what you might see, how you might help and how not to trip over your own emotions and flaws any more than necessary! Jan: Thanks for the interview, Sue Collins and Nancy Robson. Everyone will face the tough issues addressed by this book. It is not a question of – IF – RATHER – it is a question of WHEN. How can readers obtain a copy of this essential book, contact you to speak, or find out more about you both? Nancy: Thanks so much for such terrific, thought-provoking questions and for this opportunity, Jan! Sue: A BIG thanks to you Jan for this interview. I enjoyed the questions. This entry was posted by Jan Bowman on Friday, August 22, 2014.